In last week’s blog post, we discussed the book, Plastic Ocean, by Captain Charles Moore and Cassandra Phillips. In their book, they share the following six steps for how to reduce our reliance on throw-away items, including plastics. The authors want our conservation efforts to help prevent the “plastic soup”–like the sample pictured at left– from spreading in the ocean. Closed loop recyclability: How easy is it to recycle this product? Extended replacement time: How long will this product last? Reduced maintenance time: Is the product maintenance-free? Potential number of products replaced or made obsolete: Does this product eliminate the need for a lot of other products? Raw material extraction stress: Is the product 100% post-consumer material? Nontoxic status: Are the components benign from a biological perspective? 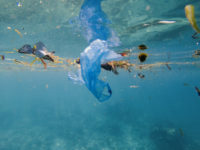 In case you missed reading about Captain Moore and his work investigating the floating mass of plastic in the ocean, known as The Great Pacific Garbage Patch, check out our blog post, Plastic Soup in the Ocean.